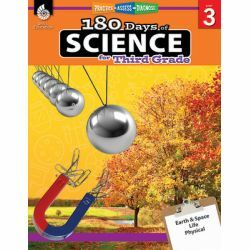 180 Days of Science for Third Grade provides teachers and parents with 180 days of daily practiceto build students' science content-area knowledge. The quick, diagnostic-based activities allow busy teachers to cover science content daily. Through these weekly units, grade 3 students will analyze and evaluate scientific data and scenarios, answer constructed response questions, improve their understanding of science and engineering practices, and increase their critical thinking and reasoning skills. 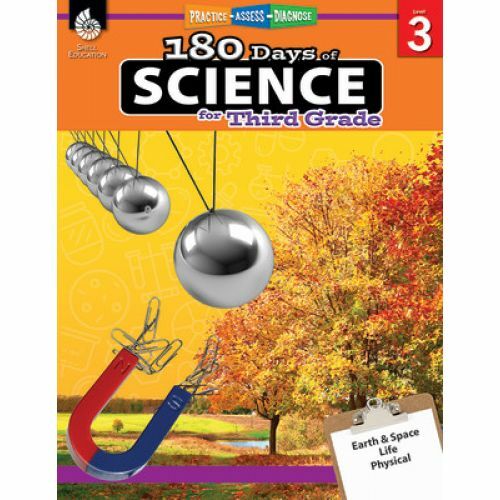 Each week will assess students' knowledge of grade-level science content, and focuses on a grade-level topic within one of three science strands: physical science, life science, and Earth and space science. By integrating scientific practices, language arts and math concepts, disciplinary core ideas, and crosscutting concepts, this resource helps teachers meet Next Generation Science Standards (NGSS) and state standards in their classrooms. With these daily activities, students will learn to think like scientists in no time! Digital files are included.